ORG provides innovative solutions for the Norwegian subsea oil and gas industry. Implementing new technologies since 1999, the company has developed a successful toolbox and workflow for exploration of oil and gas. Using induced polarisation for hydrocarbon prospecting allows for a considerable increase in effectiveness of the investigation. An IP anomaly, which coincides with a prospect outline, represents a significant increase in prediction reliability. Use of other methods such as seismic, well logging and magnetics helps to further increase the prediction confidence. The DNME exploration method complements seismic and controlled source electromagnetic (CSEM) techniques and has a proven track record with a high success rate of more than 90% in the North and Barents seas, as well as Russia. ORG Geophysical offers an exploration service with a very high success rate of advising the outcome of an exploration well, prior to drilling. The DNME is based on the detection of two independent, hydrocarbon (HC) indicators, namely resistivity and IP contrasts. The combination of the two gives a unique HC signature. Its origin is due to the development of reducing conditions over hydrocarbon pools. Rocks overlying a HC accumulation change their chemical composition through vertical micro seeps. The DNME survey is designed to capture anomalies in mineral distribution overlying mapped prospects. 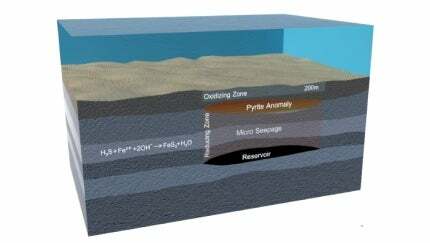 The DNME method detects anomalous geochemical alteration zones in sedimentary rocks, some distance above hydrocarbon accumulations. The target volume being quite shallow and the IP signature is quite pronounced allows a towed system to be used, despite the increased noise levels that are inherent to such systems. Chemical changes taking place around the grains as a result of the applied transmitter current take time to relax. For this reason, the IP effect is observable as a relatively long-lived imprint of the imposed DC-field after the current is shut off. The signature of IP is dependent on the fact that the spatial contrasts of the field survive, and the measurement equipment is designed to capture that. For better understanding of the geological condition in the survey area, in addition to the possible presence of hydrocarbons, ORG recommends clients to plan for a 3D survey, followed by a 3D inversion of the survey data. The survey will not replace the need for 2D or 3D seismic processes, yet the accumulated data will guide the client’s attention to areas where ORG records anomalies associated with the presence of hydrocarbon. ORG offers to review the current geophysical data and well logs of its clients to advise where to plan the survey lines. The same data will also be required as input to the company’s inversion start models. Typical reporting time after the completion of the offshore work is 60 days. The main goal of ORG is to fulfil the client requirements with its unique technology by helping them to identify resources safely and fast with reduced costs and no environmental impacts.